The route to school today was not as difficult, sardined, or frustrated as I had anticipated. 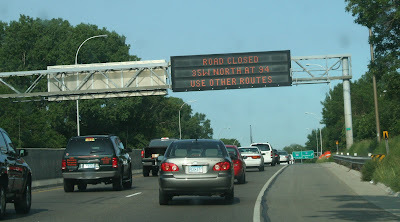 Crossing the Mississippi is an accepted movement in the Twin Cities; it slices through Minneapolis and major roads bridge between banks. I used to think how amazing it was to cross the Mississippi on the Washington Avenue bridge, moving from the east bank of campus to the west. Class was still good today. All members accounted for, two staying home. One had wanted to stay with her children, which made sense. We continued with critique, the bridge coming up in conversation, and if we looked out the conference room window, we could see the line of media vans, their antenna spiraling up from this safe place, my college. I thought of how Carolyn Forche is a poet of witness, one who has recorded the newsworthy. I think of how, in the days after 9/11 we spoke of the comfort of poetry, and every September 11th, in my classroom, we read "Keeping Quiet" by Pablo Neruda out loud. And I think of how writing about these things is so difficult, when you see the scope and range of your own geography shift like this. Yes, I am writing now, and I've written words about yesterday, and I wonder about those 9/11 poems, the ones with true reference in the afterward, and if those poems will ever work, when we have our own freight for that day. How these become history, and sometimes it is distance we need the most to write well. in the road. They were never driving. about the divorce before she did.